Though Apex Legends continues to be a bright spot for EA, the game publisher and the industry as a whole still have hurdles ahead. Today, EA confirmed that it laid off 350 people in marketing, publishing and other departments. Kotaku obtained an email sent to employees by EA CEO Andrew Wilson, which said that the main focus is increasing the quality of its games. A part of that is “ramping down” the company’s presence in Japan and Russia. Famitsu later confirmed that the Japan office has been closed entirely. Of the 9,000 global employees at EA, the 350 people laid off represent 3.8 percent of EA’s workforce. EA isn’t alone. The publisher’s biggest competitor, Activision Blizzard, let go nearly 800 employees, roughly 8 percent of its workforce, in February. Gaming continues to grow, and record-breaking titles like Fortnite and EA’s own Apex Legends show that there is plenty of money to be made. In fact, Blizzard Activision CEO announced record earnings in 2018, but also said that the company failed to reach its full potential. That potential has to do with a shift from a model that generates revenue once for a single title to something more akin to a content subscription service. In-app purchases and gaming subscriptions are accounting for more and more of game publishers’ revenues. The Financial Times reported in 2017 that, 10 years prior, one-off sales of packaged home-console software accounted for 64 percent of the global gaming market. That number dropped to 30 percent as in-game purchases and subscriptions continue to grow in popularity, as seen with games like Fortnite and Apex Legends. This more layered revenue structure creates something sticky with consumers, but also runs the risk of alienating them by constantly asking for more money, especially with a game that isn’t free to play. We’ve reached out to EA and will update if/when we know more. Video game company EA is slowly switching its business model to recurring subscriptions. The company just launched Origin Access Premier for $15 per month or $100 per year. This subscription is only available on PC. This isn’t EA’s first subscription. The company first launched EA Access on the Xbox One. For $5 per month or $30 per year, you can download and play old EA games as part of your subscription. EA Access doesn’t include the most recent games. But you can play the latest Fifa, Madden and Battlefield games a few months after their initial releases. Usually, EA Access games don’t include any DLC or extra content. In addition to full games, EA Access lets you try new EA games for 10 hours. You also get 10 percent off on EA digital purchases. In 2016, EA launched a similar service on PC for the same price. In addition to a collection of EA games, the company partnered with Warner Bros. Interactive Entertainment and other game companies. You can find indie hits, such as The Witness, Oxenfree and Trine 2. And now, EA is launching a more expensive subscription tier. With Origin Access Premier, you get new EA titles a few days before launch day. 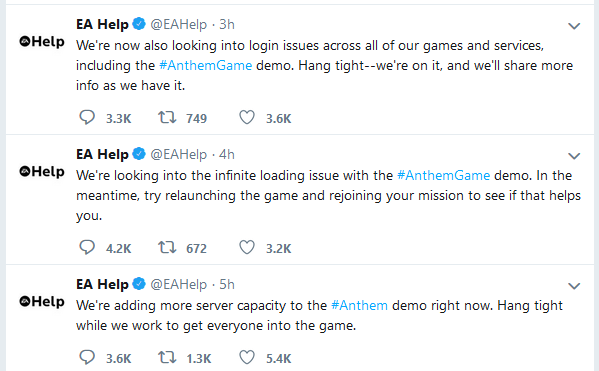 For instance, you’ll be able to download and play Madden NFL 19, Fifa 19, Battlefield V and Anthem when they launch in the coming months. Subscribers won’t have to pay for DLCs, or at least not as many. Games included in the subscription are deluxe editions (Fifa Ultimate Edition, Battlefield V Deluxe, etc.). In order to convince people to subscribe right away, EA is adding deluxe editions of Battlefront II, Fifa 18, Unravel Two, Fe or The Sims 4 right away. Other companies have launched subscription services, such as Microsoft with the Xbox Game Pass and Sony’s PlayStation Now. This is an interesting shift as game companies are getting ready for cloud computing. While many people still buy games on DVDs and play on gaming consoles, the industry is slowly going to switch to cloud gaming. You will launch a game on a server in a data center near you and stream the video feed to the device in front of you.